Chili has been a staple in my house since my kids were little. After 20 years of making the same recipe, I tried changing it up a bit. My daughter Margo was aghast when she tasted my tweaked recipe. "Why would you mess with perfection?" So there you go. Here is my original recipe. I make a huge caldron of chili, and freeze bags of it for a quick meal when there is not time to prepare dinner. Frozen chili was particularly useful when my kids were in multiple after-school sports and activities. I'd swoop everyone up after ballet/soccer/baseball/tennis/sailing practice. Come home, thaw a big bag of chili, put some rice in the rice cooker and cut up some fresh vegetables and voila...a healthy home cooked meal in 15 minutes. I have consciously tried to pack in a lot of extra vegetables in this one-pot meal. In addition to the standard onions, beans and tomatoes, I have added bell peppers, zucchini and corn. As this recipe evolved, my son Ryan entered his teenage years and he asked me to throw in more meat. So I went from ground beef to a combination of stew meat and turkey Italian sausage. The trick is slow-cooking the chili until the stew meat becomes fork-tender. In addition to the veggies in the chili, I like to garnish my chili with a lot of fresh chopped veggies. Almost to the point where you have a small salad on top of the chili. I like to add: chopped cucumbers, red peppers, avocado, green onion, cilantro and romaine lettuce. You can also add a dollop of sour cream, and a sprinkle of grated cheese if you wish. Growing up in Hawaii, we always ate chili and rice. So when I serve chili, I often make a big pot of Japanese rice and put a scoop in the bottom of the bowl before I add the chili. A few tortilla chips on top are also nice. I generally make three times the recipe below. There is not much more work in making a triple batch and chili freezes beautifully. After 20-plus years of making big batches of chili, I have never had to throw any extras out. Nothing goes to waste. Even now that my children are all adults, they will gladly take a bag or two of chili home to their apartments. Start by toasting whole cumin and coriander seeds and grinding them in a molcajete or mortar and pestle. You can take a short cut and use pre-ground spices. For more information on how to use a molcajete see my blog post. Use a food processor to chop your garlic and onions and it will save you a lot of time. See my post on how to cut corn from the cob. The chili benefits from long, slow cooking. You can rush it and it will still be good, just not as great. If I only have an hour, that is how long I cook it for. If I have the time, I cook it for about three hours. Adjust seasonings to your heat tolerance. The heat in this recipe is fairly mild. Freeze leftovers in ziplock bags. Make sure to let the chili cool before putting it into freezer bags. Packed with vegetables, three kinds of beans, two kinds of meat and lots of spices, I have been making this chili for my family for 20 plus years. I always make extra for the freezer. Over medium heat, toast your whole cumin and coriander seeds in the pot you will cook your chili in. Stir frequently so they don't burn. This only takes a minute or two. 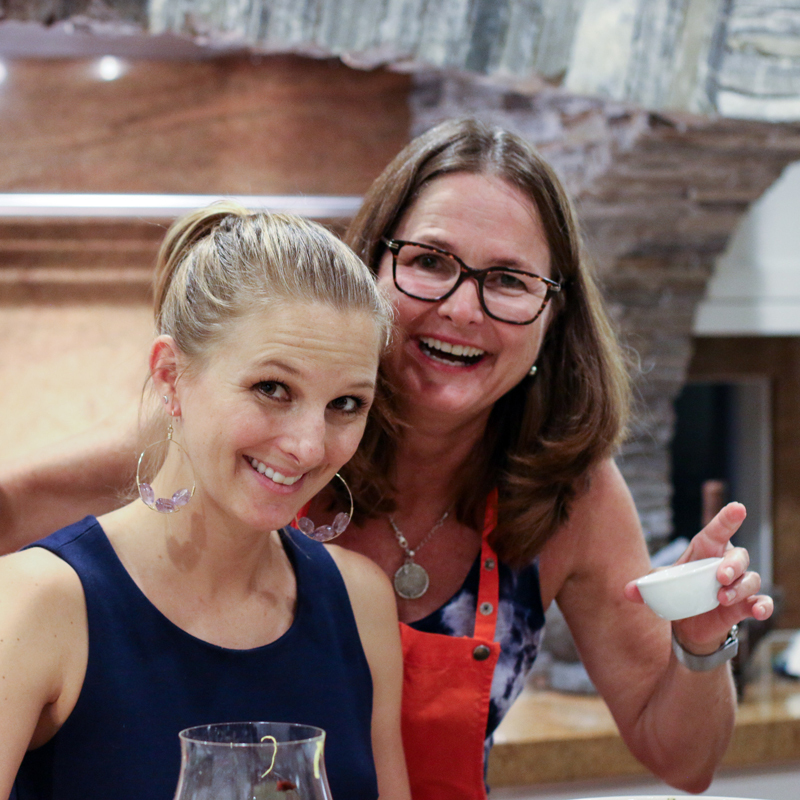 Remove seeds from pot and put in a molcajete or mortar and pestle. Grind the toasted seeds to a powder and set aside. Put olive oil in the bottom of a medium hot pan and add onion and garlic and sauté for about 5 minutes. Add ground cumin and coriander and cook another 5 minutes until everything is soft. Push onion mixture to the side of the pot and add beef stew meat and sausage meat. Brown meat, stirring for about 15 minutes, until the meat is no longer pink. If there is a lot of rendered fat in the pan, pour off most of it. Add chopped tomatoes and wine, beans and roasted peppers. Stir to mix and bring to a boil. Turn down heat and add chili powder, basil, oregano and zucchini. The vegetables and meat should be covered in liquid. If not, add more wine or water. Cook on low heat for 1 to 3 hours. Stir frequently and deeply as beans will stick to the bottom of the pan. When you are ready to serve, add the corn kernels and cook for another 5 minutes. If you want to serve Hawaiian-style, put a scoop of rice in your bowl before you add the chili. Garnish with chopped vegetables of your choice, grated cheese, sour cream and tortilla chips. In your recipe for “Mom’s Chili it is unusual to see a measurement for spices in ounces. I looked it up and found that 3/4 ounces is equal to 1.5 T. The recipe sounds most interesting and I hope to try it later. Thank you for the measuring conversion comment. I have been making this chili for years and do not use a recipe. I usually make three times the quantities that are in this published recipe. 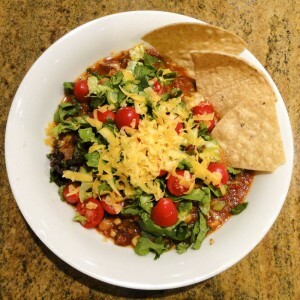 The reason I used a weight measurement when I wrote the recipe is when I triple the recipe I use a whole bottle of of chili powder that weighs 2.4 ounces — so 3/4 ounce is roughly 1/3 bottle. So that is the practical reason I wrote this recipe with 3/4 ounce of chili powder. Weighing rather than measuring or counting your ingredients, however is a good idea if you are looking for consistency. By using weight measurements you will get more consistant results with many ingredients. In baking, flour measurements, for example are more consistant than measuring flour. Likewise, measuring produce like potatoes, results in more consistency when you measure by weight rather than number, due to the varying size of potatoes. Most European recipes use weight measurements. At first it seems like measuring by weight is more work, but when you get used to it, I think you will like the results. There are inexpensive electronic scales that make weight measurements simple. Thanks for asking the question. I am sure there are others wondering about the weight measurements too. This chili practically brought me to tears it was THAT GOOD. Thank you, Kim, for making tricky diets not be a problem!! As usual you’ve outdone yourself! Your comments brought tears to MY eyes! I am so glad you like my chili and that it works with your diet. It is interesting, because I don’t think of chili as a dish for someone with a lot of dietary restrictions. I have a family member, however, who sometimes has trouble digesting food. When she does this chili is what she turns to. I think it is because all the ingredients get cooked down, making it easier to digest. So this is my trick. Make a huge batch and freeze individual portions. This way you cook once and have a stash of meals just waiting for you to defrost. Chili in the freezer is like having money in the bank. Making this for the boat parade. For my Vegan friends can I leave out the meat? I have never left out the meat, but I don’t see why it wouldn’t work. There are a lot of goodies in this chili that should carry it. You might want to consider adding some artichoke hearts for a little extra texture. I’d buy the frozen ones, and thaw them and drain them before I added them. They can be added late in the cooking process as they are already cooked. My Fiancé and I made this chili and we absolutely loved it! We loved all the extra veggies added to this recipe. It’s wondeful for this time of year and leftovers! Thank you Kim! Thank you Jennifer. This is a great newly wed or oldly wed recipe. Both my husband and I love having some of this chili stashed in the freezer for those nights when you don’t want to cook, but want to eat something wholesome and homemade. Glad you enjoyed it!